View of Himley Hall from across the lake and grounds. The mansion was built in the early 18th century, in the fashionable Palladian style. The wings were later extended by architect William Atkinson between 1824 and 1827. 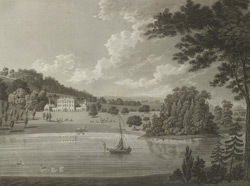 The grounds were landscaped by Lancelot 'Capability' Brown, who added a new approach road to house, a pleasure lake and walkways, planting trees throughout the grounds.